If you have cataracts, you now have a choice! You can be glasses free after surgery! During cataract surgery, a lens implant is inserted to replace the cloudy natural lens that has the cataract. Today there are many different Active Lifestyle Lens Options available. The goal of these lenses is to reduce or eliminate your need for glasses or contacts, very similar to the goals of a LASIK patient. Due to technology advancements, there are even lenses that help you see up close and far away! This allows you to see your watch, use the computer and drive without glasses! At the Castleman Eye Center, we are known for providing the latest technology in cataract surgery: the nanoFLEX™ Aspheric Lens (allows for distance and near vision without glasses), the Acrysof Toric Lens (corrects astigmatism) and the Tecnis® Multifocal Lens (allows for distance, intermediate and near vision without glasses). We are also now offering Laser Cataract Surgery with the LENSAR™ Cataract Laser. This is the most advanced cataract surgery technology available today. Depending on your pre-operative vision and desired visual goals, Dr. Singh may recommend a customized treatment plan using one or a combination of these advanced technologies. During your consultation, Dr. Singh will determine which procedure and lens is best suited for your lifestyle and activities. The goal of these tailored procedures is to reduce or eliminate the need for glasses and provide your best visual outcome. The goal of Blended Vision using the nanoFLEX™ Lens is to enable most distance and near vision tasks without eyeglasses. The nanoFLEX™ Lens in the dominant eye is set for distance and the non-dominant eye is set for near vision. The two eyes work together for a combined result that is clear and comfortable vision at all distances. Although, over-the-counter reading glasses may be necessary to read finer print in dim light. The Castleman Eye Center is pleased to offer Alcon's Toric IOLfor astigmatism correction after cataract surgery. The recent advancements in technology have now made it possible to provide an effective solution for patients that have astigmatism. Until recently, patients that were IOL candidates and had astigmatism, had no option built into the lens, that would correct the astigmatism aspect of their visual condition. Surgeons would typically perform LASIK after insertion of an IOL to correct the complete visual picture. If patients did not have astigmatism correction after IOL implantation, then contacts or glasses would be required to deal with the astigmatism. Multifocal intraocular lenses (IOL’s) are an advanced technology option for patients who wish to reduce or eliminate their dependence on glasses or contact lenses after cataract surgery. 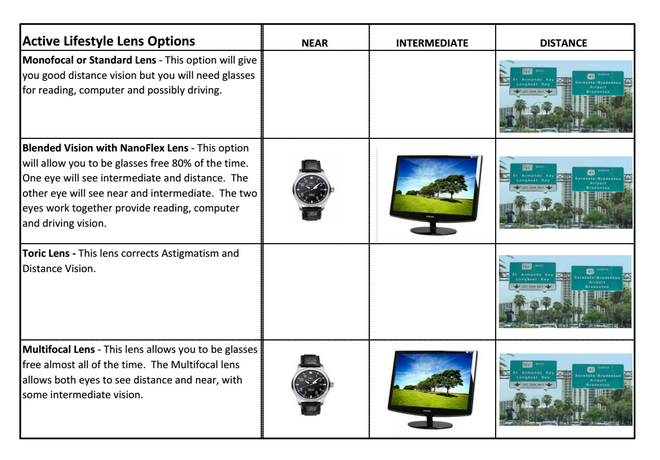 Multifocal lenses allow patients to see close up (reading) intermediate (computer) and distance (driving). There are several different types of multifocal lens implants to achieve your vision goals. Some of these lens options are: Tecnis® Multifocal, Crystalens® and Acrysof® IQ Restor.